Last year at the Geneva motor show, we witnessed the birth of the Mercedes-AMG GT Concept. 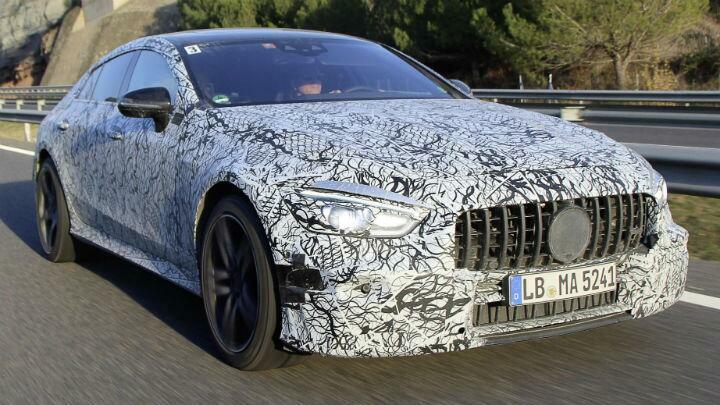 It is, in short, a four-door Mercedes-AMG GT supercar. Which - in short – is a very good thing. The production version will debut at this year’s Geneva show. The prototype GTs – as pictured above, on what looks like a jolly good day out – are currently undergoing the final testing phase. After that, it’s off to Switzerland to give the Porsche Panamera a very big headache. As AMG boss Tobias Moers has long promised, the four-door coupe is yet another extension of the growing AMG GT family. A very fast member of a very fast family. The GT Concept we saw last year wasn’t a lengthened GT chassis, though – it used the underpinnings of the mighty E63, with lots of lightweighting thrown in. And power. Expect a mad twin-turbo V8. Hope for the E63’s excellent and childish switchable drift mode. Cross your fingers for noise.